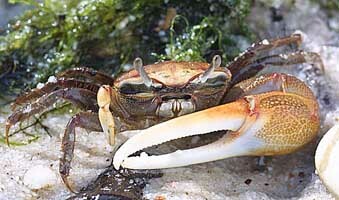 Fiddler crabs are small, semi-terrestrial crabs of the genus Uca that are characterized by extreme cheliped asymmetry in males. 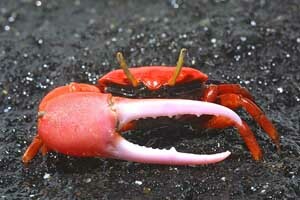 They are most closely related to the Ocypode (ghost crabs). There are currently 104 recognized extant species. 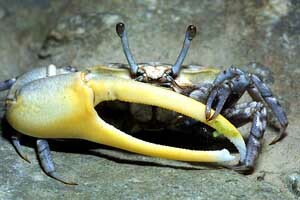 The common English name “Fiddler Crab” comes from the feeding of the males, where the movement of the small claw from the ground to its mouth resembles the motion of a someone moving a bow across a fiddle (the large claw).